Preheat oven to 425°F. Layer ½ lemon slices and 1 sprig of rosemary on the bottom of a baking dish. Scatter ½ of garlic around the pan. Season both sides of chicken with salt and pepper. Lay chicken on top of lemon rosemary bed. Place remaining lemon slices on top of chicken breasts. Place rosemary sprig between the chicken breasts. Sprinkle with remaining garlic. Drizzle chicken breasts with olive oil. Bake for 40-60 minutes until chicken is cooked through (1 pound takes about 40-45 minutes, 5 pounds takes 60 minutes). Cover with aluminum foil for 5 minutes and let the chicken rest. Serve and enjoy! Cook's Note's: You can double, triple, quadruple, etc this recipe. I make it with 5 pounds of chicken so we have enough to eat all week. 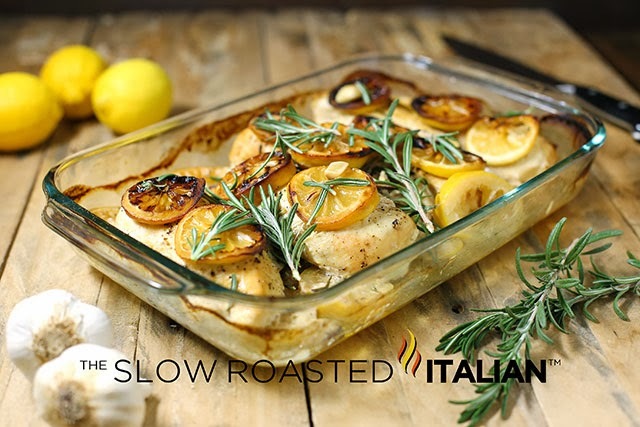 If you prefer your chicken more browned on top, at the end of your cook time turn the broiler on and cook for 2-3 minutes until chicken and lemons are browned.